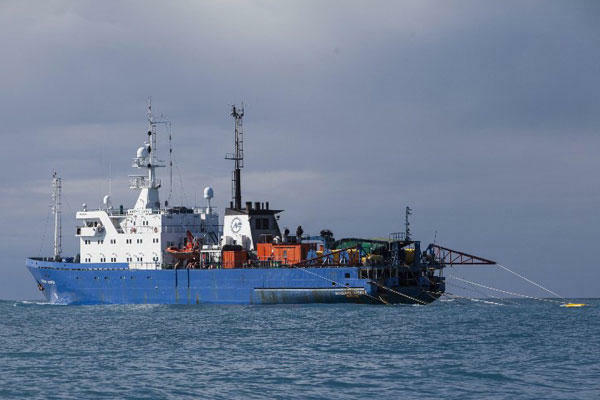 A ship uses seismic air guns to map the ocean floor. As you are reading this, a ship is very likely miles off the North Carolina coast, mapping the ocean floor. It’s part of a National Science Foundation project that’s using seismic testing, blasting sound waves through the waters. Oil industry leaders and Gov. McCrory addressed the Coastal Energy Summit in Wilmington. As early as next spring, the very same controversial process will be used by a different interest: The oil and gas industry will begin looking for places it might want to drill. This past August, the Obama Administration announced it would begin allowing testing for oil and gas reserves off the Atlantic Coast. Jack Gerard, the president of the American Petroleum Institute, is pretty sure what they will find. That estimate is about 1/10 of the oil in the Gulf of Mexico, as determined by a seismic study three years ago. As the oil and gas industry’s leading lobbyist in Washington, Gerard’s comments made at the Coastal Energy Summit in Wilmington on Thursday were impossible to ignore. The industry brought a great deal of wealth to the states bordering the Gulf of Mexico. But it also, of course, caused 11 deaths and tens of billions of dollars of damage when the Deepwater Horizon blew up in 2010. Now, the industry has its eyes squarely on North Carolina. Gerard cites economic impact studies that show 55,000 new jobs and $4 billion a year coming to North Carolina, if and when offshore oil production ramps up. Gov. Pat McCrory has some ideas on where that money should go. But before that money can be counted and jobs can be filled, the state would have to get Congress to go along. Because drilling would happen in federal waters, a revenue-sharing deal with the states would have to be worked out. McCrory co-chairs the Outer Continental Shelf Governors Coalition and is working on such a deal. “I hope that we get at the minimum the same deal that the gulf coast states are getting,” he said. Several dozen protestors outside the Coastal Energy Summit – and a few inside – vehemently disagreed with the plans for oil exploration, seismic testing, and fracking. Many carried signs that objected on environmental grounds, but there are other well-established business interests that may prove to be offshore drilling’s greatest foes. “North Carolina over the past several decades has built several industries on the coast – tourism, recreational fishing, commercial fishing, the boating industry, etc.,” Lisa Schiavanato said during a panel at the Summit. Many, including the Governor, are predicting a long, drawn-out fight. That goal – protecting the North Carolina coast from the very serious harm of another Deepwater Horizon-type event – is, at this point, about the only thing all sides can agree on. The days of oil rigs off the coast of the Outer Banks is still many years away, if it ever comes. But the state of North Carolina is already making plans that will allow oil companies to use seismic imaging to search for possible oil reserves. Donald Van der Vaart, the Energy Policy Advisor with the Department of Environment and Natural Resources, told the North Carolina Energy Policy Council that seismic testing was last done off the coast of North Carolina in the 1980s. Governor Pat McCrory wants the state legislature to approve more than $1 billion in bonds as part of his long-term transportation plan. Money from that bond measure would fund road, rail, port and airport projects across the state. He plans to ask the General Assembly to borrow more than one billion dollars in January, to fund parts of 21 projects.